"So ready to buy your dream vehicle, but not sure how the auction works…take a few minutes to go through our knowledge centre to learn all about this"
An Auction Sheet is a comprehensive car inspection report, created by many professional car inspectors working at this auction. From this information, you can get a clear picture of the true condition of the vehicle, allowing you to know just how reliable your investment will be. Did you know that purchasing vehicles at this kind of auction directly is the most reliable way to find and obtain what you need? Every vehicle goes through a comprehensive inspection before an auction opens by the auction houses' professional car inspectors. This is done by performing a comprehensive inspection of the mechanical condition, body condition, and interior condition of a vehicle and their findings are filled out on an auction sheet. This professional inspection not only uncovers obvious damages, but also any kind of hidden problems, such as flood damage, odometer rollback or the even the vehicle having been salvaged, all this major details will also be noted on the auction sheet. Many import dealers are not so willing to disclose the "Auction Sheet" for a particular vehicle they mean to sell to a customer even if the vehicle has been bought through the Japanese Car Auction including with it the "Auction Sheet". Since the "Auction Sheet" gives an awareness to the customer of the hidden problems with the vehicle. There are too many lemons in this market, which have been imported by the countries all over the world and which are sold at massive profits. - You can know condition of a vehicle through an auction sheet i.e. an inspection report by a professional car inspector. - You can know every thing about the vehicle. The auction sheet shows you even all the hidden problems for that particular car. - This inspection report is a declaration of the condition of the vehicle to the customer to know the overall of the vehicle they're about to invest in. In order to full understand the kind of inspection they perform, an auction grade is given indicating the vehicle's condition and is included on the auction sheet. The auction grade of a vehicle is an index of a vehicle's overall condition. You can know the general, rough condition of the vehicle through this auction grade and the vehicle's diagram that is also included in the auction sheet, even if you are unable to read Japanese, which is one of the benefits of having an auction sheet. Each auction sheet however includes notes by the inspector, an inspector's report which includes important information on a vehicle's condition e.g. major mechanical trouble, such as engine knocking, a slipping transmission, or major body problems, such as major accident damage or major rust damage. 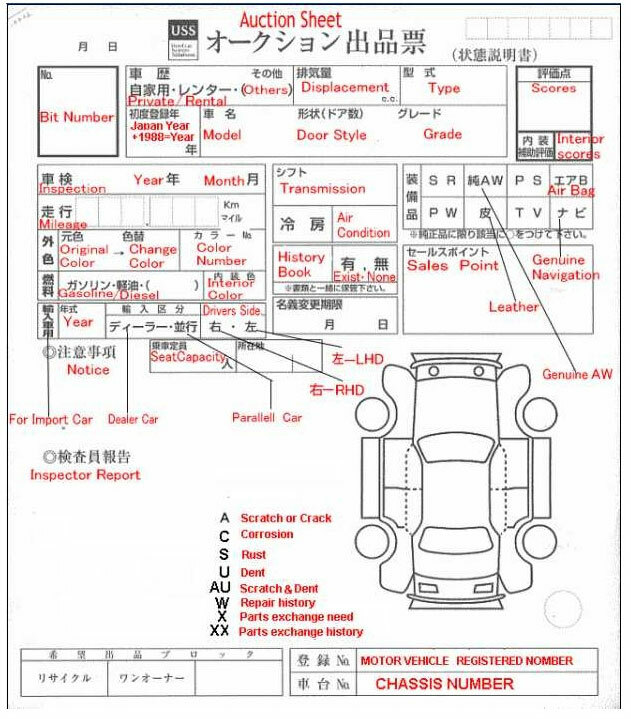 This information would provide you with a clearer picture of the true condition of the vehicle, allowing you to make a more informed decision concerning your purchase, yet this inspector's report is written in Japanese. Through this auction guide you will get help to know the exact condition of the car mentioned in the auction sheet. You just have to go through the points in following and read the auction sheet; you will be clear about the car placed in the auction. Please note that this auction sheet is prepared by the third party, the experts of auction. There is no hand of the seller in preparing it so you will get the actual picture of the car. 5 Vehicle is like new. All parts are new. No repair needed on vehicle. Normally given to vehicles less than 3 years. R or A A vehicle which has been in an accident where some parts have been repaired or replaced.